Another Trump Assault On The First Amendment. Trump Continues to Target the First Amendment. In a wild 24 hours, the following occurred. The Guardian Reported that former Trump Campaign CEO, and later the President’s Chief Strategist, Steve Bannon, described the June 9, 2016 Kushner/Trump Jr., meeting with Russians as “unpatriotic” and “treasonous” in an soon to be released book by Michael Wolff. Bannon also said there was “zero chance” that Kushner and Trump Jr., did not walk the Russians up to the next floor to meet Donald Trump. Trump attorneys send another cease and desist letter to the author of the book, Michael Wolff, and his publisher Henry Holt & Co., to stop publication of the book Fire and Fury: Inside The Trump White House. The letter also demands they issue an apology to President Trump for the supposedly untrue and defamatory comments in the book. Ironically, the letter also suggests an invasion of privacy action against the author and publisher. Let this sink in folks. The President of the United States is threatening legal action to prevent publication of a critical book. Have you heard of such a thing before? Many other Presidents, including Obama, had numerous false and defamatory things said about them. They never responded with threats of legal action. Not even Nixon did anything like this. Imagine if Obama had done this. Imagine how conservatives would have responded, imagine the nutty conspiracy theories that would have spawned, had Obama threatened to sue Trump for his Birther lies. Or if Ted Cruz’s father sued Trump for insanely claiming he was involved in the JFK assassination. Imagine Obama suing to stop release of Dinesh D’Souza’s Obama’s America or Jerome Corsi’s Where’s The Birth Certificate? This is just another case of a thin skinned President who believes his numerous unapologetic lies about others are perfectly fair, but that criticism of him brings the hammer of the law against the critics. Beyond the hypocrisy, this is just stupid on so many levels. Let’s list some of the reasons this is stupid. It won’t stop the release of the book, instead it will increase sales of the book. Already the tempest around this book has driven it to the #1 ranking on Amazon, and that’s just from pre-sales, it doesn’t even get released until January 9th. Literally hundreds of thousands of this book have already been paid for. Nothing sells a book like attempts to ban it. The forbidden fruit, or book, is the sweetest. My wife is an author and for a long time I have jokingly suggested that our most effective marketing ploy would be to get one of her books banned. Edit & Update: In defiance of the President’s threats the publisher announced that it is moving up the release of the book from January 9th to January 5th. It’s all a bluff, there will be no lawsuits. Trump has the high standard of proving the defendants acted with malice. Lawsuits will open Trump and his processes up to discovery. In this discovery Trump will not be able to claim executive privilege or that discovery would interfere with national security. He would be the plaintiff and the burden is on him to prove his claims, to include his claims the material in the book is false. Evidence sought by defendants to counter his claims of falsity or malice must be made available. The threats keep this negative stuff in the news cycle for longer. They also smack of Presidential desperation an insecurity. The threats are also themselves negative news as they show a President appearing to attack 1st Amendment rights. Many Americans will be rightly offended by the President of the United States using the prestige and weight of his office as a platform to threaten lawsuits against citizens speaking critically of him. The President opens the door for lawsuits against him for his numerous defamatory lies. While Trump seems greatly offended regarding lies about him he has no problem flagrantly lying about others. He regularly attacks media figure and celebrities with untrue statements. They generally do not respond with actions for defamation. Now the thinking may well be “if the President is going to do it against us, why shouldn’t we do it against him?” For example, in his famous “Morning Joe” tweets, Trump falsely said Mika Brzezinski was bleeding badly from her face after a supposed facelift. Why shouldn’t she sue for that defamatory comment? He also falsely tweeted “Chris Cuomo, in his interview with Sen. Blumenthal, never asked him about his long-term lie about his brave “service” in Vietnam.” That was a lie. It was Cuomo’s first question. These sort of examples are just of few of many where media figures and celebrities might sue a President who does this sort of thing all the time. Perhaps the President’s notorious “fake news” awards will provide fodder for lawsuits. All of this is within the context of a President with a history of attacks on the 1st Amendment. 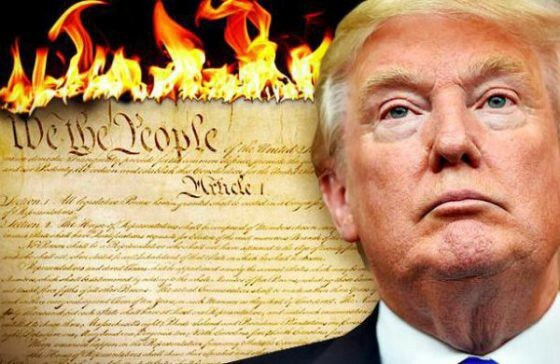 Trump’s Hitler-esque branding the media the “enemy of the people” has been amplified by specific policy suggestions undermining perhaps the most fundamental freedom of a democracy. He has advocated that the Senate Intelligence Committee conduct McCarthyesque hearings to investigate what he deems “fake news.” He has advocated changing the tax code to punish the NFL for allowing players to exercise their 1st Amendment rights. He has suggested action against the broadcast licenses of media companies he doesn’t like. This hollow threat of lawsuits should be viewed as a continuation of despotic efforts to undermine the 1st Amendment.